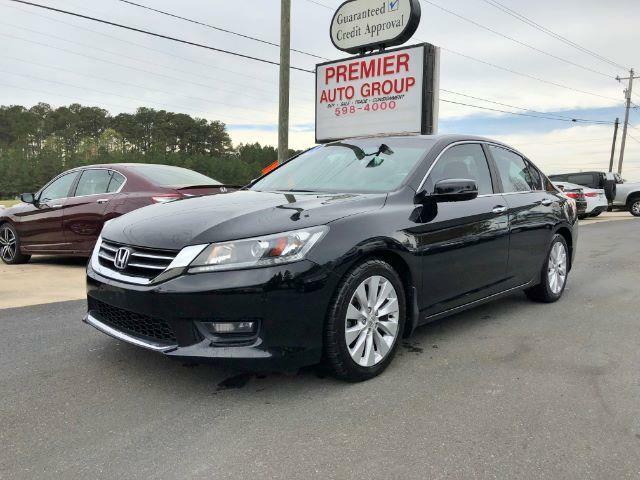 FRESH OIL CHANGE **, DEALER SERVICED **, FULLY DETAILED **, SAFETY INSPECTED **, FOR FREE CarFax VISIT PREMIERAUTOGROUPOFDURHAM.COM ****, Black Cloth.2014 Honda Accord EX Black27/36 City/Highway MPGAwards: * ALG Residual Value Awards * 2014 IIHS Top Safety Pick+ * Green Car Journal 2014 Green Car of the Year * 2014 KBB.com Brand Image Awards2016 Kelley Blue Book Brand Image Awards are based on the Brand Watch(tm) study from Kelley Blue Book Market Intelligence. Award calculated among non-luxury shoppers. For more information, visit www.kbb.com. Kelley Blue Book is a registered trademark of Kelley Blue Book Co., Inc.Based on 2017 EPA mileage ratings. Use for comparison purposes only. Your mileage will vary depending on how you drive and maintain your vehicle, driving conditions and other factors.Premier Auto Group has been serving the Raleigh/ Durham area for over 20 years by taking care of the customer and giving fair deals.